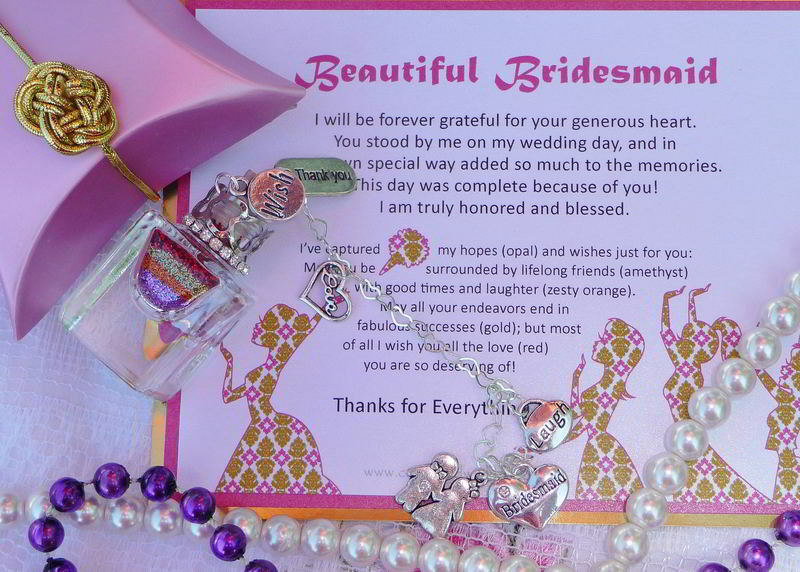 Bridesmaid Thank You Gifts from Captured Wishes! Chic and Creative Bridesmaid Thank You Gifts: Behold! Captured Wishes! Bridesmaid gift emergency! You've juggled the impossible seating plan, chosen the flowers and cake, got the centerpieces, arranged the bachelorette... but what about the bridesmaids? They need a gift that says 'thanks' without being over-the-top. Something cute, memorable and lasting. MEMORABLE is key. These friends have thrown you a bridal shower, maybe even helped with a bachelorette party, and they've maybe squealed with delight in some parts throughout the entire planning process. How can you thank them for their friendship, love and support? We've done it for you with this precious wish vessel that comes complete with verse and color key. All you need add is your love and signature. Each unique Captured Wishes bridesmaid thank you gift is a vessel filled with love and joy in the form of fairy dust; within - different colors symbolically represent the different feelings you want to express. If you had begun to despair in not finding the perfect way to thank your lovely bridesmaids for stopping you from falling apart on the big day, worry no more. Captured Wishes specializes in saying what cannot be said, putting into words exactly what you are thinking, and packaging it all in a delightful box that's an experience to open as well as to own! One look at these adorable gift vessels and there will be no doubt what exactly it is you feel in your heart! Each Captured Wish vessel comes in beautiful, custom packaging, with a lovely verse card which puts the thoughts and emotions you have trouble expressing into words for you. The bottle (40mm height including cork x 20mm wide) contains carefully layered Fairy Dust, explained by the color key.